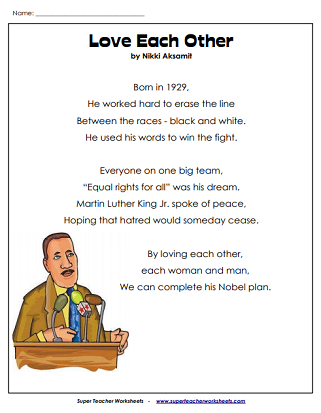 Print these worksheets for Martin Luther King Day (third Monday in January). 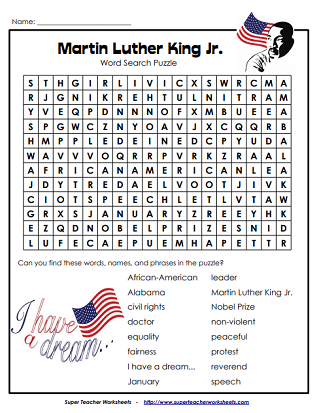 Worksheets include math practice sheets with pictures of M.L.K., as well as a Martin Luther King word search puzzle. Click on the the core icon below specified worksheets to see connections to the Common Core Standards Initiative. Article about the life of Martin Luther King. Includes reading comprehension questions. Approximately 2nd-3rd grade reading level. Biographical overview of Martin Luther King's life. Approximately 4th-5th grade reading level. Martin Luther King Jr. spoke of peace in hopes of achieving equal rights for all. Find the words freedom, non-violent, fairness, peaceful, equality, and leader in this word find activity. Picture of Martin Luther King giving his "I Have a Dream" speech in Washington D.C. Basic addition math drill sheet with addends 0 through 9. Includes Martin Luther King graphics. Find the sums of three-digit addends. These problems require knowledge of regrouping. Includes an MLK-themed word problem and a picture of King. Subtract three-digit numbers. These problems require borrowing/regrouping. There is an MLK word problem and picture. Multiply 3-digit by 1-digit numbers. 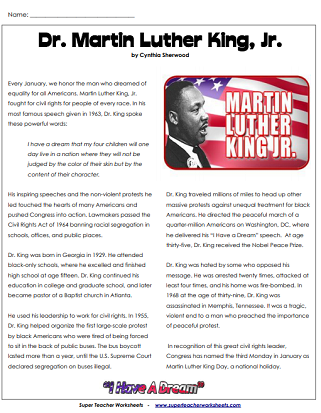 (example: 453x7) Includes a word problem related to Martin Luther King Jr. Day and colorful MLK graphics. We have worksheets for all major holidays.